Flashing beacons supplement stop signs and are intended to reinforce awareness of existing stop signs. 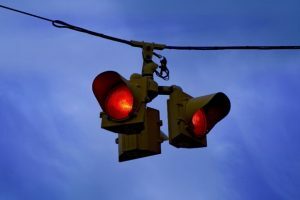 Overhead flashing beacon for two-way stop at four-way intersection (Shutterstock). Beacons are flashing lights intended to draw a driver’s attention towards the associated traffic control. Flashing beacons supplement stop signs and are intended to reinforce awareness of existing stop signs. 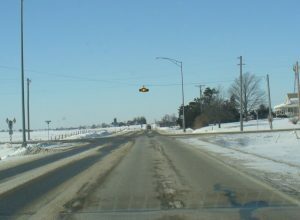 Two different types of intersection beacons are typically used, including standard overhead beacons mounted over the intersection and sign-mounted beacons that may be mounted on the stop sign or stop ahead and intersection ahead signs. Several studies have evaluated the effectiveness of beacon installation. The following table summarizes the studies where crash reductions were found. 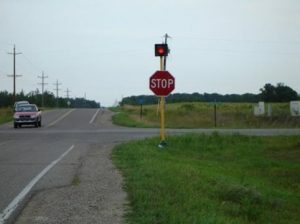 Use of overhead flashing beacons in addition to stop signs at all-way stop (Neal Hawkins/Institute for Transportation). More information is provided in this technical brief, Flashing Beacons (PDF), which summarizes information about flashing beacons relevant to Iowa. 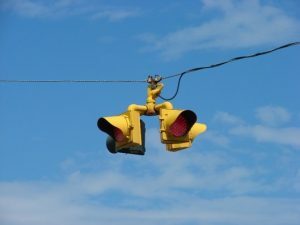 Use of overhead flashing beacons at two-way stop for four-way intersection (Neal Hawkins/Institute for Transportation). Antonucci, Nicholas D., Kelly K. Hardy, Kevin L. Slack, Ronald Pfefer, Zikhron Yaacov, and Timothy R. Neuman. Volume 12: A Guide for Reducing Collisions at Signalized Intersections.NCHRP Report 500: Guidance for Implementation of the AASHTO Strategic Highway Safety Plan. Transportation Research Board, 2004.